Ted Perkins was raised with saltwater and sea life coursing through his veins. As a young boy growing up in Gulf Shores, AL, Perkins watched his grandfather run a se﻿afood market and work as a commercial fisherman. Nearly 20 years later, it was only fitting that this entrepreneur ha﻿rk the heralding from the Gulf. Perkins' uncle, a Millington native, saw the need for fresh seafood in the Memphis area. 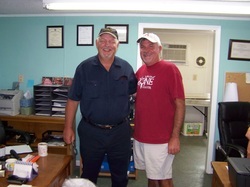 Ted, having amassed several connections in the seafood industry down in coastal Alabama, seized the opportunity to deliver fresh fish from his friends and wholesalers on the beach to landlocked Western Tennesseans; Paradise Seafood was born. One of Ted's more loyal customers, Don Willadsen, would house Perkins in a spare bedroom for his five-day-at-a-time business venture, and the friendly relationship proved to be very profitable: Don and his wife became business partners. In fact, the now famous Paradise Seafood trucks were Willadsen's brainchild and design. The Paradise Seafood crew has only slightly expanded the number of hands on deck, with Ted's wife Kelli quitting her full-time job and Don's wife Jan coming out of retirement, all in the name of insuring fresh, quality seafood to Memphis. One instantly knows they have found the Paradise Seafood truck, as they ususally accrue quite a crowd around them. Shoppers can usually find items like red snapper, grouper, ahi tuna, salmon, scallops, oysters, and amberjack in the truck's refrigerated cases. Fresh offerings are written daily on the dry boards, as well as some of their homemade creations and even unusual finds. One of their more popular items is the smoked tuna dip (one of Ted's creations) as well as Cajun Season Jumbo Shrimp, and both are well-deserving of their popularity. Paradise also offers homemade crab cakes that are conveniently offered frozen, along with some irregulars like frozen alligator meat and alligator sausage. These Creole-inspired ingredients are sold alongside hard-hitting jambalaya and knock-you-out Julie sauce. With footholds in markets like the Memphis Farmers Market, Collierville Market, and the Agricenter Farmers Market, it is no wonder that Memphis is buzzing with interest in this friends and family based operation. In fact, people are surprised to discover that the operation has been around for as long as it has. "We came to the Agricenter about four years ago, and that's when business exploded," explains Perkins. "People really begain to understand that if you want it fresh, then someone has to be going and getting it for you. There is really no other option." Perhaps this is why Paradise Seafood sees roughly 100 or more customers in a given day. In fact, the fare at Paradise Seafood is a popular location for sushi-grade seafood: their ahi tuna is as fresh and local as one could get. Paradise offers fresh lump crab meat, also perfect for sushi rolls and crab salads. In fact, trends in eating sushi and other fish based recipes have brought in regulars and even some interesting stories: one loyal (yet overweight) customer decided to maintain a diet that consisted of mostly seafood, and then subsequently lost almost 100 pounds. It is that push in healthier and fresher eating that has given Paradise Seafood a hand in delivering a tremendous product. Success for an operation that has little to no competition has not tarnished the humbleness of Paradise Seafood: they continue to work like mad by trekking back and forth from the beach to Memphis for ten months a year, 6 days a week, all the while still crashing at Don's house. On their down time, Ted and Kelli Perkins enjoy their nest in Gulf Shores, and continue their childhood hobbies of fishing and hunting. Don't expect the profitable business to turn up in a storefront any time soon: Perkins explains, "If it doesn't work here, then we can drive and set up somewhere else where it does." Indeed, if it ain't broke, then please don't fix it.